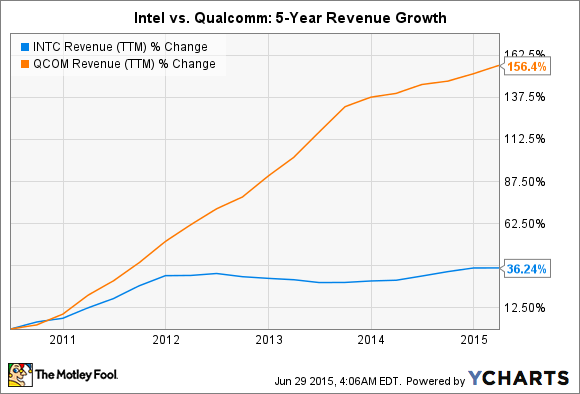 Better Dividend Stock: Intel Corporation or Qualcomm Inc.? Which chipmaker is a better pick for income investors? Intel (NASDAQ:INTC) is the world's largest manufacturer of PC chips, while Qualcomm (NASDAQ:QCOM) is the biggest mobile chipmaker. Both companies offer comparable dividends, but they also face various game-changing threats. Let's look at Intel and Qualcomm's dividend growth, and which is a better choice for long-term income investors. Intel currently pays a forward annual dividend yield of 3%, compared to Qualcomm's 2.9%. Over the past 12 months, Intel paid out 37.5% of its free cash flow as dividends, compared to 54% for Qualcomm. Some investors might interpret that as Qualcomm being more "generous" with its payout ratio, but it also means Intel has more room to increase its dividend. However, Qualcomm's free cash flow over the past 12 months fell 40%, due to a $975 million antitrust fine in China. But looking further back, Qualcomm's 34% increase in 12-month free cash flow over the past five years demolished Intel's 7.5% gain. Qualcomm has raised its dividend annually since introducing one 13 years ago, and will likely continue that streak in the future. Intel's dividend was stuck at $0.22 per share from 2012 to the end of 2014, after which it spiked by just 4.5%. By comparison, Qualcomm boosted its dividend an average of 22% annually over the past four years. Qualcomm has a better-looking dividend, but its net income notably plunged 46% annually last quarter, due to that one-time Chinese antitrust fine. But looking back further, Qualcomm's trailing 12-month net income actually climbed 125% over the past five years, compared to Intel's 24% growth. Both companies have comparable operating margins between 27% and 28% over the past 12 months. Yet both companies' margins declined over the past four years for various reasons. For Intel, lackluster demand for PCs and a controversial commitment to subsidizing mobile partners have weighed down its margins. For Qualcomm, the rise of cheap ARM (NASDAQ:ARMH)-licensed mobile chipmakers including MediaTek and Rockchip has lowered price expectations. However, investors should remember that 74% of Qualcomm's pre-tax earnings last quarter came from its licensing business for CDMA technologies. Those licenses give Qualcomm a 3% to 5% cut of the wholesale price of nearly every smartphone on the planet. Of course, bottom-line growth is meaningless without robust revenue growth. In that regard, Qualcomm flattened Intel over the past five years, thanks to soaring demand for smartphone and tablet processors. However, Qualcomm's top-line growth is extremely top heavy, with about half of its revenue coming from Apple (NASDAQ:AAPL), Samsung (NASDAQOTH:SSNLF), and their suppliers. Qualcomm sells two main products to those companies: wireless modems and mobile processors. But Samsung used its own wireless modems and processors in its new flagship S6 devices, and there are persistent rumors that Apple will either use its own modem or Intel's in future iPhones instead of Qualcomm's. Qualcomm could be in trouble if Samsung and Apple continue dropping its components from new devices. Meanwhile, Intel keeps trying to buy its way into the mobile market by helping OEMs with steep discounts on chips, co-marketing agreements, and financial assistance in redesigning logic boards for Intel chipsets. This costly "contra revenue" strategy caused its mobile division to post an operating loss of $4.2 billion last year, down from a loss of $3.1 billion in 2013. Intel now combines those mobile losses with its PC business in the new "client computing" group, but it doesn't plan to stop paying those subsidies anytime soon. Both Intel and Qualcomm are solid tech dividend stocks to own for the long term, but I believe Qualcomm is currently the better pick for two reasons. First, many investors were scared off by the bad news about Samsung, but ignored the fact that CDMA licensing accounts for the bulk of the company's bottom line. As a result, Qualcomm shares have fallen 18% over the past 12 months, signaling a possible long-term buying opportunity. Second, Qualcomm offers more consistent annual dividend increases and has better free cash flow growth. Qualcomm certainly faces plenty of challenges in regards to cheaper mobile chips and turnkey solutions, but I believe those issues won't drag down its dividends.